Thank you for purchasing our MB33 Retro. My thanks go to Hans Thomann and Bernd Siegismund from Musikhaus Thomann and Hari Rupp from the Music Store in Cologne, without whom this project would not have been possible. Thanks also to Artur Grönke and Harry Brandes, both of which have contributed greatly to the development of the MB33. The MB33 Retro was, like his predecessor, developed by Dipl.Ing. Stefan Schmidt. Stefan Schmidt is one of the best engineers worldwide in this field , emphasized by building his own synthesizer „Schmidt“, a high-end synthesizer, used in all the top studios in the world. As with the original it was despensed of the on-off switch, since the power supply consumes almost 20 times more electricity than the MB33 by itself. For damage or consequential damage of MB33 (due to operation of the device by a different AC adapter), no liability is accepted. Set the desired receive channel with Midi-Select. Connect the output of the MB33 with a mixer, amplifier etc. For means of safety turn down the volume control of both devices. 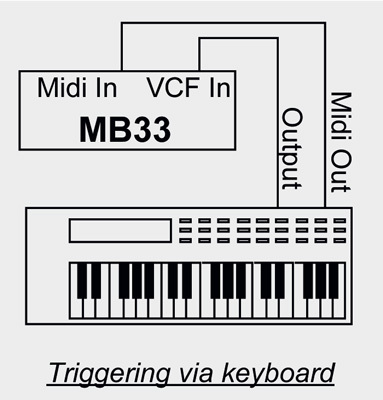 In order to control the MB33, connect the MIDI IN socket with the MIDI OUT (or THRU) of a MIDI controller (computer, keyboard, sequencer …). 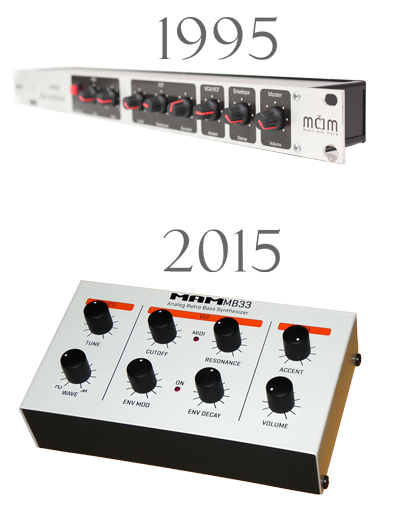 Make sure that the preset receive channel of the MB33 matches the transmit channel of the Midi controller. The MB33 now carries out Autotuning. Once this process is completed, the MIDI LED turns off and the MB33 is ready for use. The ON LED must be lit permanently, as long as the device is turned on. If you now send notes to the MB33, the Midi-LED lights up in the note rhythm. 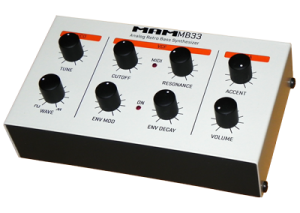 The MB33 playes a short demo melody when you simultaneously press the Autotune button while connecting the power supply. The demo melody is stopped by pressing the Autotune button once again. 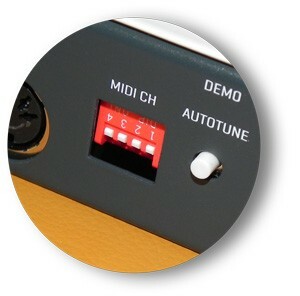 The MIDI SELECT switches allow the preset of the MIDI receive channel. VCO is a voltage controlled oscillator and generates the waveforms square and sawtooth. The spectrum of the square wave contains only even harmonics. Since on the other hand all harmonics are represented in the spectrum of the sawtooth wave , this offers a fuller sound. The two waveforms can be mixed with the Wave controller in any desired ratios. The TUNE control changes the pitch of the VCO by +/- 50 cents. In the center position the pitch is adapted to the tuning of other MIDI instruments. The Slide (also known as portamento) enables sliding from one pitch to another. This effect is triggered automatically, when more than one note is played on the MB33 . In this case, the Envelope will not be triggered. The CUTOFF controller specifies the frequency (cutoff frequency) of the VCF. Overtones above the cutoff frequency are cut off. On the other hand all Overtones below the cutoff frequency pass the VCF unchanged. The control range of the cutoff controller is designed so that in its maximum position the VCO signals are not changed. In minimum position almost all overtones are suppressed. 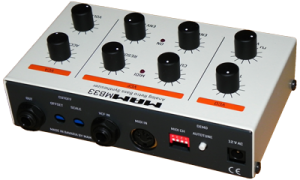 The RESONANCE controller can be used to raise the overtones within the range of the cutoff frequency. In the left position no raising of overtones takes place. Turning the control to the right increases the raise of overtones. 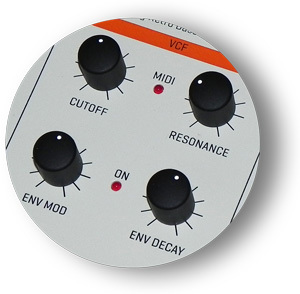 The ENV MOD control determines how much the Envelope Generator (ENV) affects the Cutofffrequenz. The Envelope generates a control voltage that can be used for modulating the cutoff frequency (controller ENV MOD), (VCA has a separate Envelope with a set voltage gradient). The control voltage is always regenerated with each note received, but not if the AutoSlide feature is enabled ( more than 1 note is played simultaneously). How quickly the ENV voltage decreases, depends on the position of the ENV-control. The Accent is decisive for the dynamics of your playing by accentuating individual notes, so that they are to be clearly differentiated. 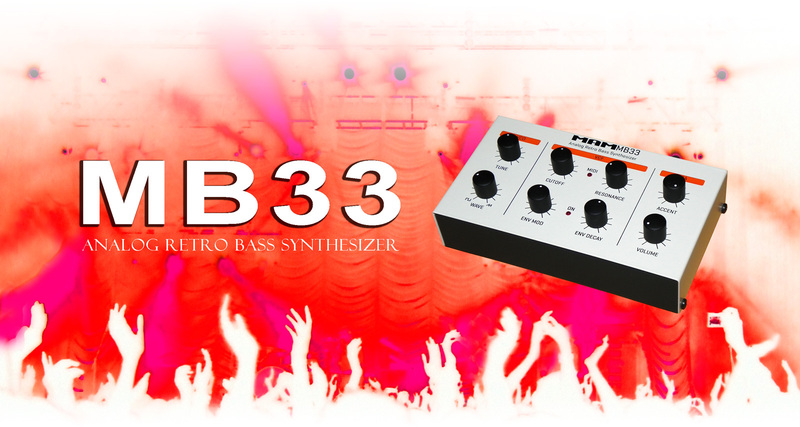 The Accent of MB33 is particularly effective, because it affects several parameters simultaneously. The volume is raised significantly. 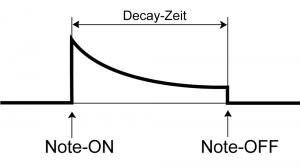 For the duration of the Accent, Decay time is set to minimum (at Accent-end the currently set Decay time is reestablished). The effect of the Accent may therefore be additionally reinforced by a long Decay time. With increasing Resonance the Accent effects an increase of the Cutoff frequency. By using the Accent , you can control the intensity of the increase of Volume and Cutoff frequency. 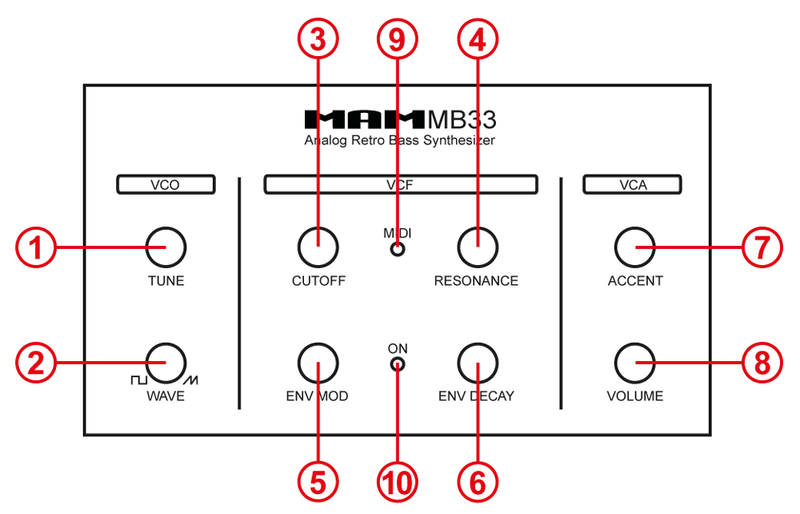 The VOLUME control sets the output volume of the MB33. A maximum volume can – for certain parameter settings – lead to overriding of the output signal (Accent on maximum, Resonance to minimum) , which becomes noticeable in form of distortions as a consequence. Turn down the Volume, if this is not a desired effect. At the VCF IN socket external audio signals can be connected for further processing of sound with the help of MB33. Connect an external audio signal to the VCF IN socket of the MB33. The internal oscillator is thereby separated from the input of the VCF, but connected to the external signal. As a result, only the processed audio signal is played at the MB33 Output. 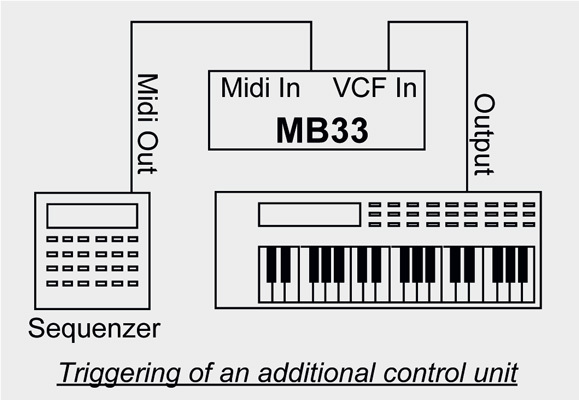 All functions of the MB33 – including Midi control – are still active. Since the external signal in the MB33 first passes the VCF, then the VCA, it must be triggered via MIDI. There are merely note-ON (VCA lets the signal pass through) or Note Off messages (the VCA blocks) required, the pitch values ​​are irrelevant. When triggering the VCA the Envelope is automatically triggered, thus to modulate the cutoff frequency of the VCF. Note that the Envelope will not discharge, if Auto Slide function is activated. 3. You can now edit the external audio signal using the controls of the MB33.